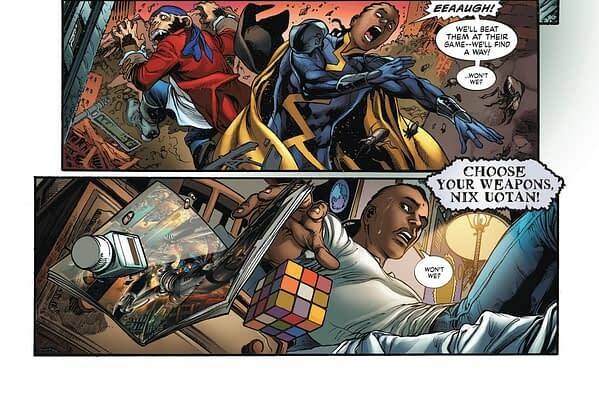 Multiversity has been on my most-anticipated list from the moment it was first announced. 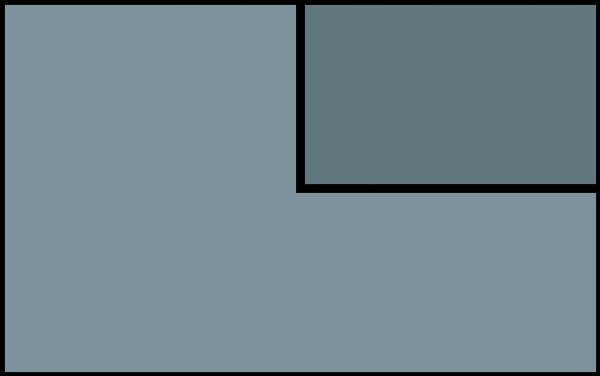 As a child I was always fascinated with the idea of alternate universes–how history could have diverged and developed differently from what we’re already aware of, and the way it’s various permutations can change characters we think we know so well. Moreover, Grant Morrison has been my favorite writer since I first picked up a copy of JLA #5 in my local comic shop as a nine year old lad. 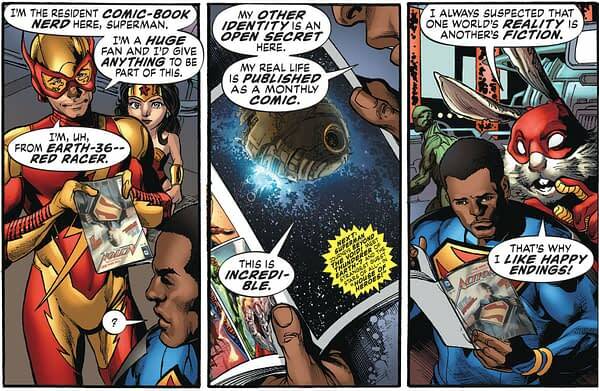 The very idea of Multiversity felt like a perfect combination of two things I enjoyed…Of course, no one ever told me I’d have to wait five years for it to actually become a thing. 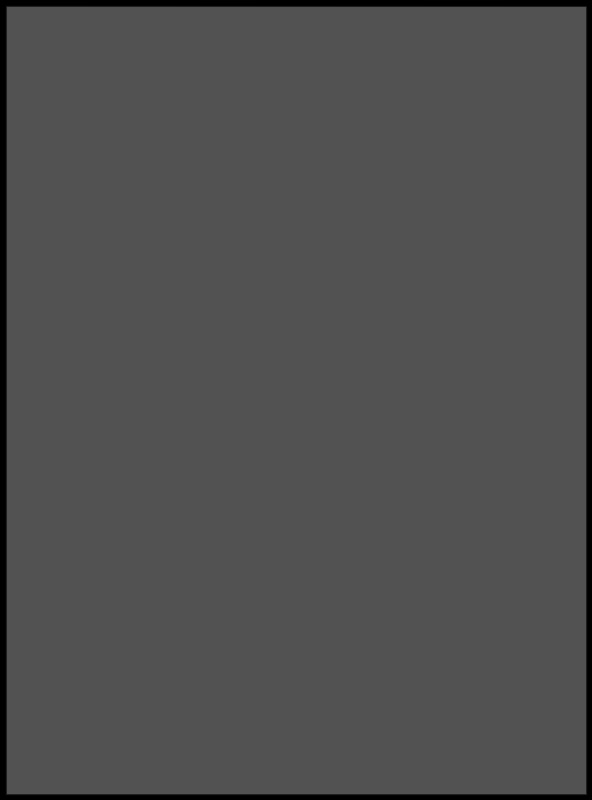 Still, despite the wait, I can’t say that the book let me down. 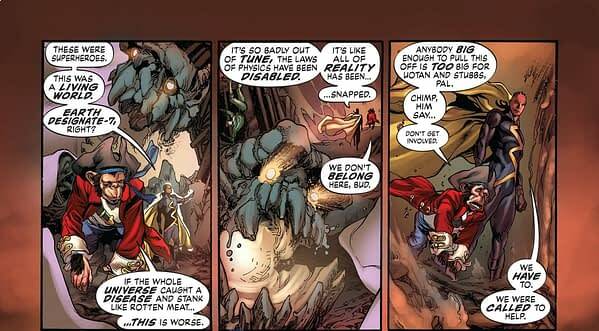 True to the DC All Access copy, Multiversity is indeed the most Morrison-ian book I’ve ever read. It’s the latest tale in the story that Morrison has been crafting with the DC Universe since the early 90’s, where he takes the superhero and distills it down to its purest essence: the potential of humanity. An undying idea that we created to save ourselves, and help guide the way into becoming the best version of ourselves. The book immediately invites us, the reader, to join in–positing the idea that we’re just as much a part of the DC multiverse as everyone else. And as a part of that multiverse, I have taken it upon myself to finish the dissection that Nix Uotan never got to. Nix Uotan returns! Or, should I say, Superjudge? 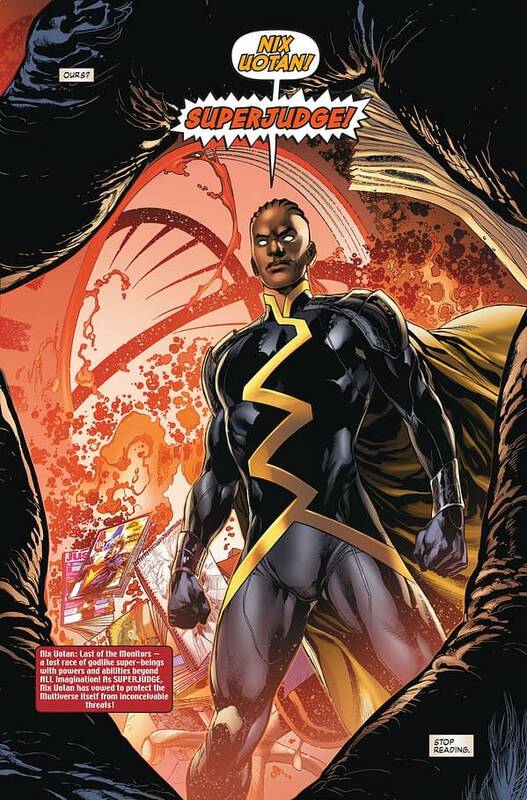 Last seen in Final Crisis, Nix was once no more than another member of the rigid Monitors. 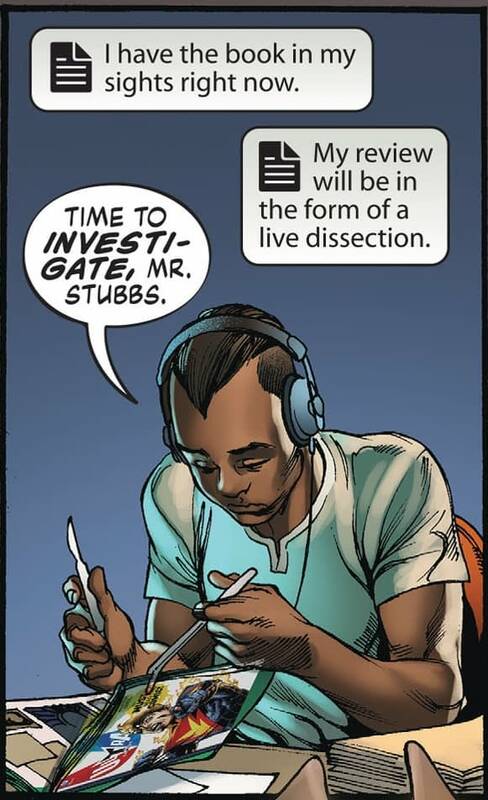 Final Crisis hinted that each Monitor was being subtly altered by the worlds they watched over, and I think Nix Uotan is the ultimate proof of this, as he’s turning into a superhero. He’s got a secret identity, a side kick and everything! 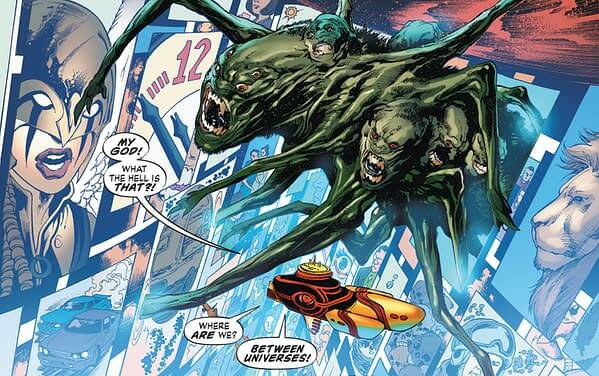 One of the questions posed by Final Crisis was, “What happens when evil wins?” The book posited that the universe was a living being the same as everything inside it, and that when evil “won”, the universe itself got sick, and diseased. And like anything else that gets sick, the systems that made it work properly began to shut down. Here we’re presented with something similar–a world where an evil has taken over, and as a result the very laws of physics are starting to shut down. Another sign that Nix has been hanging around the heroes too long–he boldly (or stupidly, depending on your point of view) sacrifices his life to save the last hero of Earth-7. The Thunderer, the “aboriginal Thor” Morrison had been talking about when he was explaining all the heroes he intended to introduce into Multiversity. Nix asks him to collect heroes from the other fifty worlds and basically kick-start the fight against the mysterious Gentry. Also, who but heroes boast like that? “Tell them there are things beyond gods?” Wow. Of course, despite Nix’s boasting, he is quickly shown the limitations of his abilities, ending up as a “normal” human once more. This is not exactly a new experience for him, as he was initially sentenced to live out the rest of his life as a human on New Earth for his failings as a Monitor. This time though, he’s stuck on what appears to be Earth-33, given the mention of “Ultra Comics”, the one-shot Morrison intends to tell the story of our Earth. It’s also worth mentioning that although the Gentry have told him to “choose his weapons”, he’s already done so by sending the Thunderer to collect the heroes of the multiverse. Speaking of the multiverse, we’re given a brief glimpse into it via the comic book on Nix’s nightstand that presents the goings-on of Earth-23. 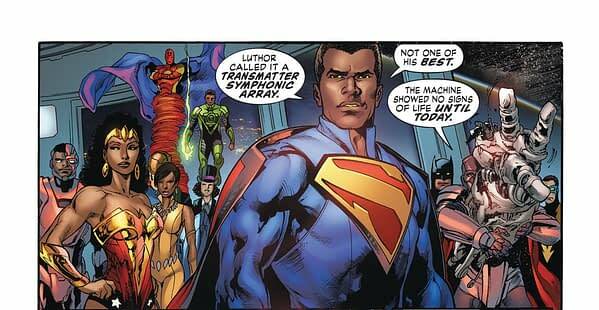 While we’re on the subject of Earth-23 here’s a better glimpse of that world’s Justice League. This Earth is important because it’s made several appearances so far already. 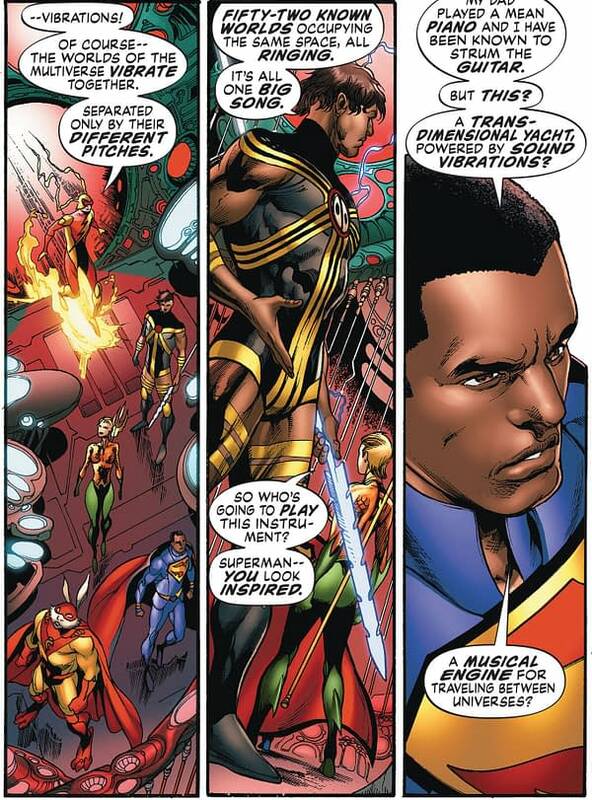 Its Superman played a part during Final Crisis, and re-appeared for a brief interlude during Morrison’s run on Action Comics to set a bit of ground work for Multiversity, like the machine that can transfer beings across worlds. What’s interesting about this League is that seems to be “further” in development than the one on “Earth 0” or “New Earth” or whatever they’re calling it these days. Their League is much larger, more fully formed. It suggests events don’t always mirror each other, even on the Earths that closer resemble the “original”. 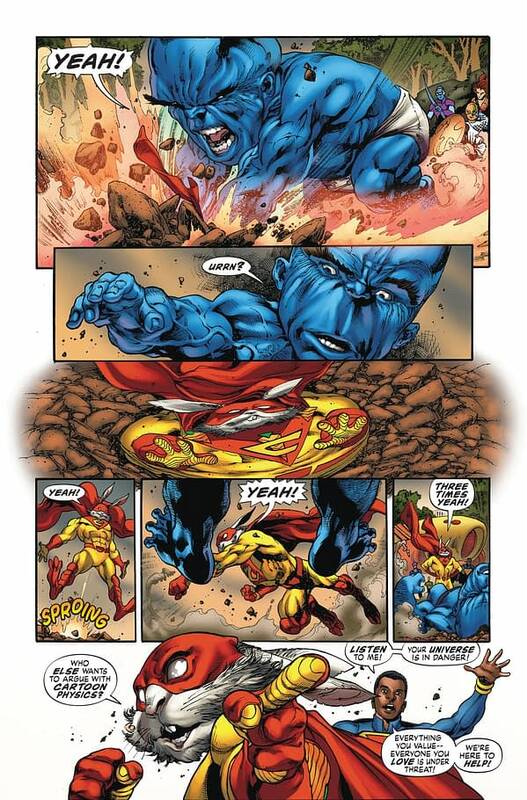 A few things are important here: For one, it’s almost certain that Superman and Captain Carrot met, since everyone was around to give Darkseid the smackdown at the end of Final Crisis. 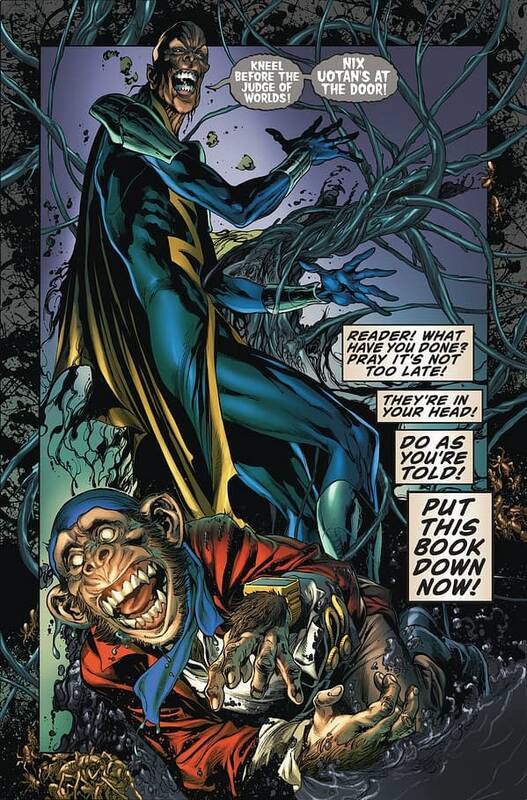 But Final Crisis also showed the breaking down of spacetime, so it’s quite possible that the entire event is missing from some people’s heads. 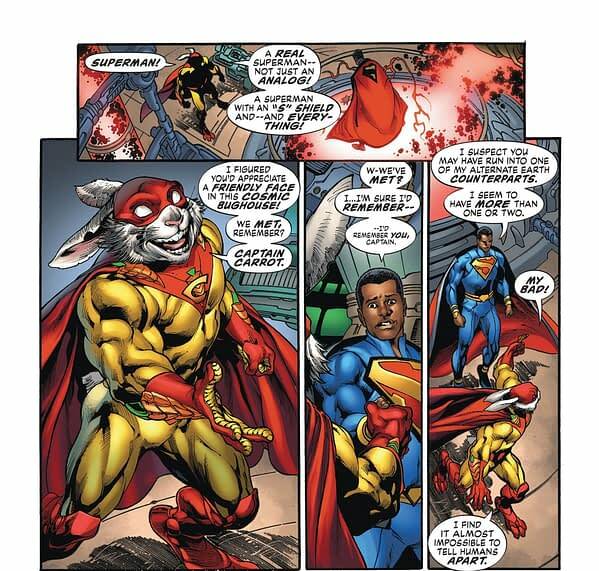 Of greater importance is Captain Carrot recognizing how crucial having “a Superman” is. Grant’s always made Superman seem like the greatest hero there is–from JLA when we discovered that he was still alive in the 853rd century, to the actions of the Supermen of the Multiverse helping to save creation itself in Final Crisis. 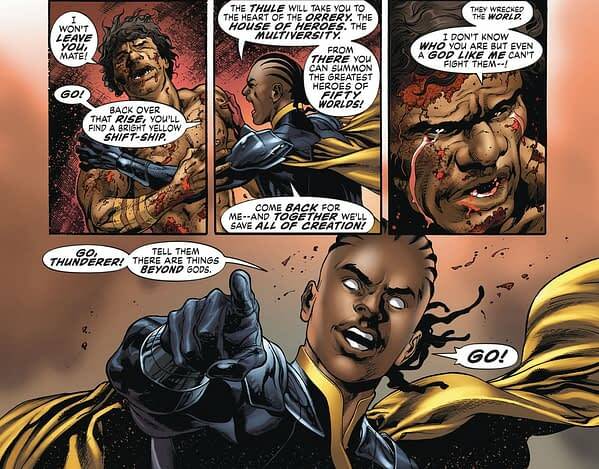 Usually though, the writers of multiversal tales attempt to make any version of a character besides the originals somehow “inferior” or less heroic. The theory is that it makes the originals feel more iconic, but I feel more than anything what it does is de-legitimize the stories of the alternate world heroes–what’s the point when we know “the originals” can knock out any threat they’re facing in seconds flat? Fortunately, Grant’s side-stepped that, as it’s clear that for this story the heroes of other worlds will be the ones who are in charge of saving creation, rather than just relying on the ones from the DC proper that we’re used to. Once again, there are a number of cool things about this page. For one, it’s stuffed to the gills with Easter Eggs, like Bloodwynn and Gypsy from earlier incarnations of the Justice League and Lady Quark from Earth-6 in the upper left. The mini-Wonder Woman and Steel are from an Earth first mentioned in Action Comics #9–regrettably, their Superman was defeated and killed by the corrupted “corporate” Superman from another world. And then there’s the other awesome thing that I didn’t notice until I hit this page. As an avid comic book fan, it’s nearly impossible to go a day without reading or seeing an article about the importance of diversity in comics. And while I agree with the basic premise, often I grow tired of all the talking. Here’s a creator, arguably at the peak of his career, who’s just doing. There’s very little that’s homogenous about Multiversity, and this page is just one example of that–the “House of Heroes” is inclusive–it has men and women of all ethnicities and sexual orientations working alongside one another. The message is clear–we’re all capable of becoming superheroes. Everyone’s important. Worth repeating is that none of these heroes are from New Earth. Those guys tend to take over everything. Here Morrison introduces two separate ideas: one, that each Earth can view the other’s adventures through the monthly comics that are published. It’s wonderfully meta, but it’s also such a simple concept even a newcomer could understand it. The other is Captain Carrot’s “That’s why I like happy endings!” line. This idea actually dates back to Morrison’s Animal Man, where after literally inserting himself into the DC Universe to have a chat with the book’s star, Buddy Baker finds his recently lost family restored to him. Less because of any “story” reason, but more because if we truly are in charge of another world’s reality, then who are we to leave other people to such grim fates? Also of note is that Earth-36 was the first world hit by the “corporate” Superman Calvin Ellis defeated in Earth-36. Their Superman, “Optiman”, was defeated…and supposedly “killed and eaten”, leaving the Justice 9 down their most powerful member. But it seems Red Racer will have the chance to make up for that–helping to save creation with his knowledge of comic books. This sounds like more Morrison-ian nonsense on first look, but in actuality it’s just Grant taking a concept introduced decades ago to its natural end. Flash long ago established that all the worlds occupied the same space but were separated by vibrating at different speeds. Here Morrison has extrapolated those vibrations out so that they all make their own songs, their own sounds of music. It sounds crazy, but it’s also not the first time creation has been represented by music–in The Silmarillion, J.R.R. Tolkien had Middle-Earth constructed by that world’s “god” and his “angels” singing everything into existence. It’s a very old idea that simply isn’t used as frequently as a lot of the other old ideas that we see in most fiction. As our heroes begin their journey through the multiverse, readers are given a glimpse of what it looks like between different universes. Each one represented by different comic book panels, because that’s what Multiversity is about–a giant love letter to, and about, comic books. I’m gonna be honest, I’m only showing this one because it features Captain Carrot getting the best of a Hulk analogue. That’s just too entertaining not to put in as many places as possible. And at the end, we’re shown the final state of Nix Uotan. Fortunately, when the fate of reality and creation itself is at stake, things aren’t as cut and dry as normal. Look at this version of Nix like an unfortunate “failure state” if our heroes can’t win and he’s left in the hands of the Gentry too long. But they’ll win…right? Be back next month so we can talk about how possible that is. Sage Ashford is a college kid with far more hobbies than he has free time. You can find him on Twitter @SageShinigami, but also at his own blog Jumping in Headfirst.